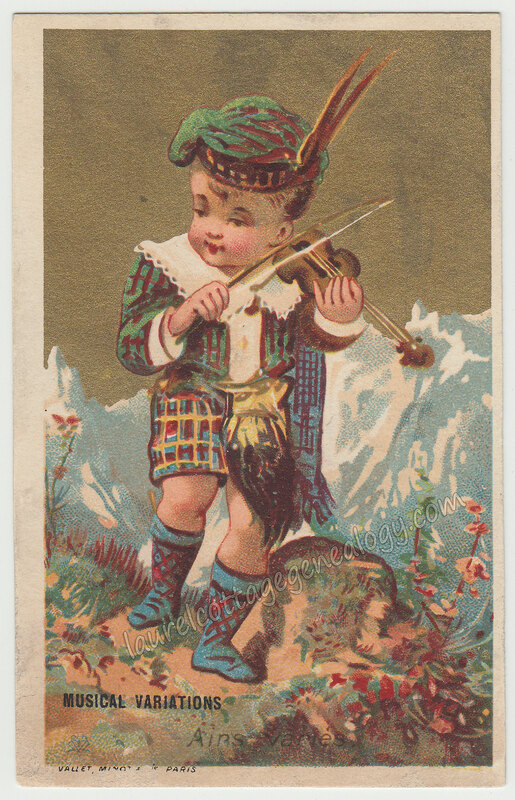 Trade card, circa 1880s – 1890s. Lithographer: Vallet, Minot & Co., Paris. 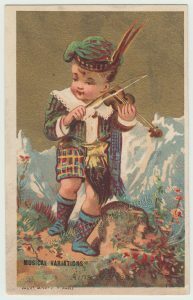 This cute trade card, of a Scottish Highlander playing the fiddle, was probably one of a series representing different countries. There is no advertising on the back, which is not that unusual, but it was surprising (just upon closer scrutiny) to find that it had been printed in France. There’s the bold black lettering in English but enlarge the image to make out the words, Airs variés, and at the bottom left, the name of the lithography company, the first word of which appears to be Vallet, and their location, Paris…..A little time spent searching the web….et voila! C’est Vallet, Minot & Cie. Below, their nice logo showing a V over an M, which together almost looks like an insect, somewhat like a butterfly. 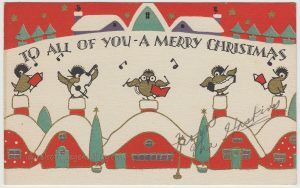 Vintage Christmas Card, circa 1920s – 1930s. 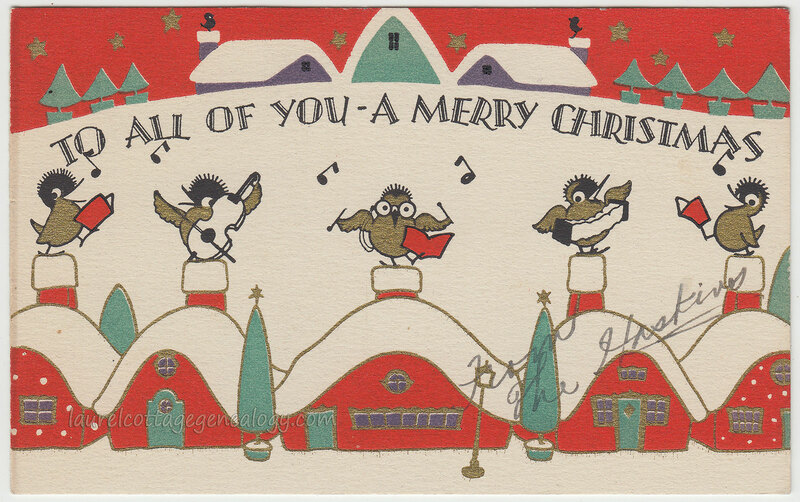 Five birdie musicians – singing and playing the cello and accordion, with the maestro directing – are spreading joy from atop snow-covered chimneys. The gold-tone in the card is of the type that has that sort of a shimmer to it, so the actual card is even nicer than the scanned image. And it was signed, “From The Haskins” but the same wish applies from us here at Laurel Cottage to you!